The sixth round of the EuroLeague Women is the start of the return phase of the qualifying round. Clubs that lost during the first round tend to play harder the second time around not only to win the game but also take an aggregate score victory. Sparta&K Moscow Region and Wisla Can-Pack are two clubs that lost in the first round games and that were able to turn their defeats into victory. At the same time they also secured the aggregate victory. Tarbes and Nadezhda Orenburg also reversed first game losses with a victory but fell short in their aggregate scores. Fenerbahçe are the only club still undefeated. But with nine seconds remaining against Rivas Ecópolis they trailed by a single point. Diana Taurasi went for a triple but was fouled by Anna Cruz. Taurasi slotted home the three free throws for her team to win (79-77). Ros Casares lost their unbeaten EuroLeague Women record at home to Nadezhda Orenburg (82-67). Tina Charles exploded with 27 points and 18 rebounds while Becky Hammon returned to action with 9 points and 6 assists in the victory. Lauren Jackson was not around when Sparta&K Moscow Region lost on the opening day to VICI Aistes and she made her presence felt in the return match with 28 points and 14 rebounds in the (85-52) victory. She was 5-of-5 from beyond the three-point line. She did not do all the work herself as she was helped by Epiphanny Prince (Epifaniya Prints) who scored 21 points and dished out 8 assists. Angel McCoughtry (right) led all the scoring in round 6 with 32 points for MKB EuroLeasing in the win against Lotus Gdynia (88-76). 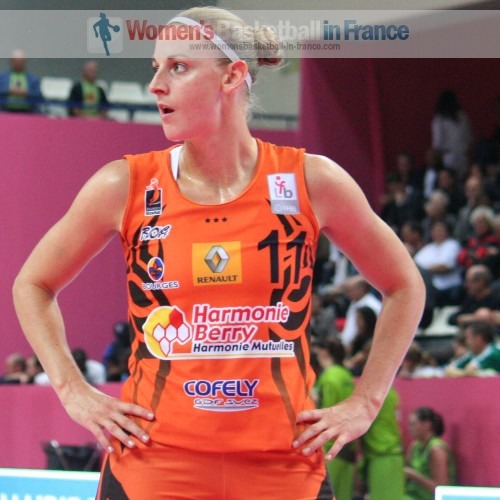 Cathy Joens fired in 26 points for Bourges Basket and Katie Douglas scored 24 points for Ros Casares. We have not heard much about Maria Stepanova this season until tonight. She led UMMC to victory with 20 points, 6 rebounds and 2 blocks (77-63) against Croatia Gospic. Select the links below to read the EuroLeague Women (or EWL) basketball news from the sixth round of games. Candice Dupree can do a lot of things: she scored 22 points and took 13 rebounds for Good Angels Kosice. However this was not enough to stop Cras Basket from taking the victory. Megan Mahoney and Elodie Godin (left) combined for 42 points as Cras Basket won the match (71-64). Godin also collected 12 rebounds while Belgium international Kathy Wambe was credited with 4 assists. Wisla Can-Pack made up for their opening day loss against USO Mondeville by winning (65-47). Mondeville are going through a lean stretch at the moment. They allowed the hosts to lead (11-3) early in the first quarter and were unable to catch up for the rest of the game. Ewelina Kobryn scored 19 points for Wisla-Can Pack while Valeriya Berezhynska was the best player for Mondeville with 14 points and 11 rebounds. Wisla Can-Pack move into second place behind Cras Basket with 4 wins while Mondeville share third place with Good Angels with 3 wins each. Pécs 2010 did the double over TTT Riga with a road win (59-49). Kelsey Griffin led Pécs 2010 with 17 points in only their second victory of the season. MKB EuroLeasing had beaten Lotus Gdynia on the road but required a special offensive performance by Angel McCoughtry with 32 points to get by their opponent (88-76). The game remained close until the final quarter when the hosts managed to break away. Zane Tamane contributed 20 points while Tijana Krivacevic scored 16 points. Monica Wright scored 23 points for the Polish team. Fenerbahçe remain unbeaten with a hard fought victory against Rivas Ecópolis (79-77). Nevriye Yilmaz (left) was the leading scorer for the Turkish side with 24 points while Courtney Paris led Rivas Ecópolis with 19 points and 10 rebounds. However it was the shooting of Spanish international veteran Elisa Aguilar with 4 triples and a total of 18 points and the hustle of Amaya Valdemoro (17 points) that kept this game entertaining. UMMC Ekaterinburg were never in trouble in this match and had the game won by the end of the third quarter. Maria Stepanova, Crystal Langhorne and Cappie Pondexter with 20, 16 and 15 points each did the bulk of the scoring for the Russians. For the French internationals, Sandrine Gruda scored 6 points while Céline Dumerc had 7 assists and 0 points. Maurita Reid led the attack for Gospic with 23 points. Like in Group B, it was a good night for playing at home with 100% success. Ana Cata-Chitiga (left) has waited patiently for three years to get her professional career going and at the moment she is the talk of the town in Tarbes. She led Tarbes to victory during the weekend in the French domestic league and she did it again with 22 points in the victory against Galatasaray MP (68-57). Tarbes went on a 20-2 run during the first quarter which enabled them to finish the first quarter leading (26-16). Tarbes stayed in front all the way to the finish. Jelena Dubljevic added 15 points while Florence Lepron scored 10 points. Both players also had 5 assists. For Galatasaray, Sylvia Fowles scored 17 points and pulled down 11 rebounds. Tarbes move into fourth place while Galatasaray drop to fifth. Halcon Avenida blew away ZVVK USK Prague (93-65) with 22 points coming from Alba Torrens. Sancho Lyttle and Erika de Souza added 21 points respectively. Halcon Avenida lead the group while Sparta&K Moscow Region are alone in second position after beating VICI Aistes (85-52). Ros Casares suffered their first defeat in EuoLeague Women action this season to Nadezhda Orenburg (82-67). Tina Charles scored 22 points and picked up 18 rebounds while Anastasiya Verameyenka scored 17 points, had 7 blocks and picked up 11 rebounds. Ros Casares appeared to have everything under control leading (56-50) going into the final quarter. However the final quarter turned into a shoot-out with a total 63 points scored. The Russiand took the lead for good with four minutes remaining and held on for just their second win of the season. Bourges Basket waited until the second half of the match to put away their hosts KSSSE AZS-PWSZ Gorzow. Bourges went into the interval trailing (32-40) but then conceded just 26 points in the second half while scoring 56 points. Cathy Joens went 6-of-8 from the land of many and finished the game with 26 points. Nwal-Endéné Miyem, Anaël Lardy and Emméline Ndongue scored 15, 13 and 11 points each while Yelena Leuchanka top scored with 22 points for the hosts. Frisco Sika Brno have improved since the opening day and were 55 seconds away from claiming their second victory when disaster struck. Liron Cohen fired in a triple which turned out to be the game winning shot for Beretta Famila (68-67). Isabelle Yacoubou-Dehoui led the Italian attack with 21 points while Cheryl Ford hit her fourth double double and had 23 points and 12 rebounds for the hosts. Ros Casares remain in first position while Beretta Famila and Bourges Basket share second place with 4 wins each.